Ames Hydro played a crucial role in the history of electricity. It was the site of the first use of alternating current, (or AC power), generated, transmitted and sold for industrial purposes in the world. L.L. Nunn and George Westinghouse applied the alternating current theories of Nikola Tesla to generate electricity at Ames Hydro and provide power to the Gold King Mine. At the time, the plant was owned by the first electric utility in the country. 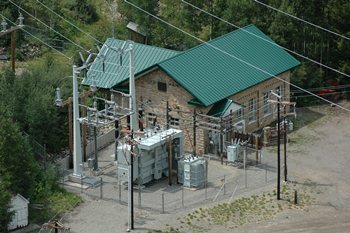 The project spurred the concept of the first engineering school dealing with alternating current in Telluride, Colo., and led to many innovations in electrical generation and lightning protection. Ames Hydro is considered a peaking plant since it takes water from Trout Lake. Two turbines power the generator; each supplied from separate diversions of the San Miguel River. The plant was acquired by Xcel Energy in 1992, as part of the acquisition of Colorado Ute Electric Association properties by Public Service Company of Colorado.